Random Rovers / Life is a journey – Page 2 – Life is a journey. We are heading to New Mexico to do a couple of months of camp hosting at The City of Rocks State Park. Day 1: Off to Corvallis with a day to see brother Stephen. We left around 8:00 AM to mixed fog and drizzle which persisted most of the day with a few sun-breaks. Overall it was a long, lackluster day. Arrived at a typical KOA, definitely less than ideal, site had huge and inconvenient puddles and I had to back out as it was impossible to pull through. We spent our day in the area just looking around, catching up with Stephen, and doing a little shopping (found a couple of Larry McMurtry novels at Browser Books that I had been searching for). Day 3: On to Red Bluff Elks Lodge for a night. On the long drive over the Syskiyou pass, the weather was warmer and drier so we arrived safe and sound after a resplendent day. The Elks Lodge here is easy for an over-night but freeway noise is a bother. Please do note Gordon’s wondrous under-carriage lighting. 7,227 feet above sea level, but none a few miles later as we passed through Reno, NV. We arrived safe and sound to good clean level sight. Unfortunately, noise from the adjacent highway again interrupted our sleep. Day 5: On down highway 95 to Tonopah, NV. A desolate drive that is bereft of perturbation and gloriously majestic. At Tonopah I found yet another book I had been looking for at Whitney’s Bookshelf, a wonderful little used book store where we have shopped before. (Need more time to read – the books in the “to read” stack are growing at an alarming rate). Even though our RV site was behind the Casino, car and truck noises interrupted our sleep regularly. Oh well happier nights are sure to come. Day 6: The never welcome and always a little too exciting drive through Las Vegas. Nothing really bad just lots of traffic, construction, and congestion. Ridgeview Resort, Bullhead City, AZ where we are relaxing for a few days in a quiet park under a blue sky with temperatures in the mid 70’s. Could not ask for more right now. It turned quite windy and cool while we were here but we managed to have a great time. Day 9: Off to Pioneer Resort north of Phoenix, AZ where we will meet up with old friends from Wyoming that we met in Texas while we still lived in Arizona. Who said this retirement stuff was simple? It was definitely worth the stop to catch up with old friends and to see the north end of Phoenix. Day 11: We are off to Tucson, to see brother Bill and sister Nanette, and also will do a little shopping for products we can’t find up north. Weather again a bit windy with blowing dust for the short drive down. Not sure how long we will spend as we still want to spend a while meeting up with old friends in Sierra Vista and to get over to Columbus and Las Cruces, New Mexico before it is time to begin our hosting duties. 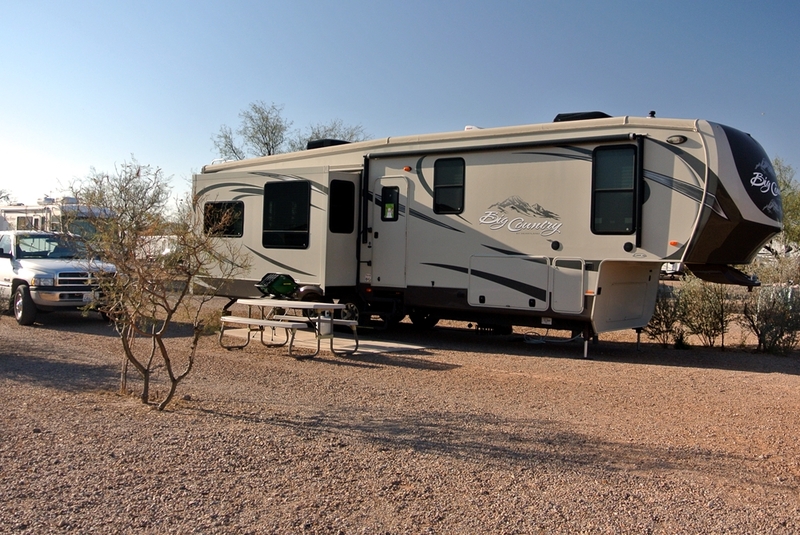 The Diamond J is a resplendent, quiet park out near the Arizona Sonoran Desert Museum and Old Tucson Studios. We stocked up on Tucson’s local Poblano Sauce, chile powders and spices from the Santa Cruz Chile & Spice Company (in Tumacacori, AZ), and of course lots of fresh tasty tortillas. We also took a walk in the desert. Day 18: Rolling again, this time to Sierra Vista where we took care of some business matters and caught up with some old friends. We weren’t able to catch everyone we would have liked to but hopefully will on our way back through in the spring. We camped just outside of Tombstone, AZ, the town to tough to die, which is still quite the tourist attraction, but having seen it more than once we did other things. By the way, we did drive by our old house and the new owners have made some nice improvements. Day 21: This just might be our shortest road day ever, GPS says 11 miles to Kartchner Caverns state park where we plan to rest for a day. Well there is Mary Ann’s Mostly Books, a quaint used book store in Benson, AZ, that we will most certainly visit. Yes the ground is wet. It has been raining off and on for the past 16 hours. This to shall pass. After all we are in Arizona. We hiked up to the visitor center during a break in the weather. Where we visited the gift shop and learned about limestone cave formations and bats. The next day we went for a “2.5 mile” hike. I put the distance in quotes as it sure seemed a lot longer and Elaine’s pedometer indicated 3.5 miles. The trail went up and down some steep hills and my poor legs complained but the views were worth it. Day 23: Finally off to New Mexico! Heading to Mesilla and Las Cruces. Another easy drive. Elaine drove the middle part which seemed to go by a lot faster than the beginning or the end. We spent a week exploring and shopping the Las Cruces area. In Mesilla we found many nice things but nothing said “take me home”. Even though it was cold and windy we lunched on “chocolate chip chocolate” ice cream from the Chocolate Lady. It was a wonderful bit of decadence. Lots of great vendors here, we did buy a new tortilla warmer and had a great green chile pizza from a wood fired oven for lunch. Christmas Eve we walked through the park. The farolitos were nice and a few people had decorated their sites. Not quite the river from the movies but still a nice walk on Christmas, our last day in Las Cruces. Day 30: We are headed to our last way-point, Pancho Villa State Park in Columbus, NM. Vacation is almost over. Lovely blue sky and sunshine for my no freeway route. Traveled south through the pecan orchards past Anthem and almost to the Mexico border before turning west on New Mexico Hwy 9 where we saw many hawks perched on poles and trees. It was a very quiet peaceful drive. Pancho Villa is a great place with a lot of history and definitely worthy of a stop. A view of the park from Coote’s Hill looking south toward Palomas, Mexico. We are parked down there someplace. While at Pancho Villa be sure to visit The Pink Store in Palomas, Mexico, a 3 mile drive south and a short walk across the border for great shopping and a fine meal. Do see the park’s museum at the visitor center for many interesting exhibits pertaining to chasing Pancho Villa across Mexico and the beginnings of US military mechanization and the use of airplanes. The Depot Museum across the road from the park will also peak your interest. If you can find the time the Luna Mimbres Museum in Deming (30 miles north) is outstanding. Day 33: This was supposed to be the final leg to City of Rocks but traveling is never without surprises. When we arrived at the park we were told they did not know we were coming that day. This in spite of the fact that we were given that arrival date by the park ranger. As there were no hookup sites we dry camped because a hookup site was to be available the next day. Day 34: I walked down to the visitor center and verified site availability for later in the day. We had breakfast and waited around. It was nearly noon when the park staff came to our site and told us that they had made another mistake and our site would not be available for another day. Well I only figured for one night so we were very low on water and would have to tie everything down and hitch up anyway just to get water so with this somber news we told the park to give us a call when our site was empty and available and promptly left for Temperate Zone RV Park about 16 miles away where we would have a full hook-up. Very nice quiet park with a very friendly and accommodating owner/hostess. Day 36: Good news our site is available so after 2,451 towing miles it is now January 2, 2018 and we are in our host site at City of Rocks State Park near Silver City, New Mexico and looking forward to a couple months here. I plan to record our adventure here in another post before we leave. Keeping the shiny side up, Your random rover Gordon.